Sherry comes in many incarnations and all of them play well in cocktails. Among the varieties are bone-dry fino sherry, ideal for fresh summer drinking, and oloroso sherry, which has more richness, more weight, and often, a little more complexity. Though fino pairs perfectly with white spirits, oloroso has its eye on the dark ones. We’re working with the Alfonso oloroso from the acclaimed producer Gonzalez Byass. 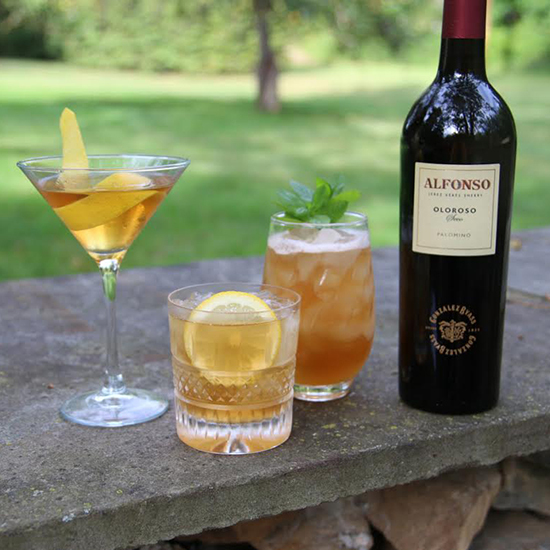 Alfonso is widely available and a great example of a drier, mixing-friendly oloroso sherry. Take it for a spin in these three cocktails—and if you’ve got any left over, it’s just as tasty chilled from the bottle. Perhaps the most perfect aperitif cocktail we know, the century-old Bamboo weaves vermouth and sherry together, needing nothing besides a balance of bitters. It is more elegant than a two-ish ingredient cocktail has any right to be. Instructions: In a mixing glass with ice, stir together 1½ ounces of oloroso sherry and an equal amount of dry vermouth, like Dolin Blanc. Add a dash of orange bitters. Stir until well-chilled, and strain into a martini glass. Garnish with a lemon peel, twisting it above the cocktail to spray its citrus oils on top. The weight and complexity of dark rum pairs perfectly with oloroso sherry, and this dead-simple cocktail just brightens the combination with a little hit of lemon. It goes down as smooth as the name suggests. Instructions: In a cocktail shaker with ice, combine 1½ ounces of good dark rum (like Brugal Añejo), 1½ ounces of oloroso, ¼ ounce of lemon juice and ½ ounce of agave syrup—that’s just agave cut with an equal amount of hot water. (Simple syrup will work, too.) Shake everything together and strain it into a rocks glass with ice. Garnish with a lemon wheel. An ideal candidate to make by the pitcher, this sophisticated cooler is like an unexpected union of sweet tea and a mint julep, with rich, complex oloroso adding an intriguing “What is that?” quality to all of those familiar flavors. Instructions: Start by making black tea—steep 1 teabag in 1 cup of hot water. In a cocktail shaker with ice, combine 1½ ounces of bourbon (we’re using Old Forester), 1½ ounces of oloroso, ½ ounce of lemon juice and ¾ ounce of simple syrup (equal parts of hot water and sugar, stirred till dissolved). Add ¾ ounce of black tea and 8 mint leaves, plus a dash of Angostura bitters. Shake the ingredients together, then strain into a tall glass with ice. Garnish with more mint.